Publication Cambridge ; New York : Cambridge University Press, 2010. "Congressional representation requires that legislators be aware of the interests of constituents in their districts and behave in ways that reflect the wishes of their constituents. But of the many constituents in their districts, who do legislators in Washington actually see, and who goes unseen? Moreover, how do these perceptions of constituents shape legislative behavior? This book answers these fundamental questions by developing a theory of legislative perception that leverages insights from cognitive psychology. Legislators are shown to see only a few constituents in their district on a given policy, namely those who donate to their campaigns and contact the legislative office, and fail to see many other relevant constituents. Legislators are also subsequently more likely to act on behalf of the constituents they see, while important constituents not seen by legislators are rarely represented in the policymaking process. 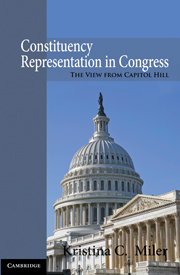 Overall, legislators' views of constituents are limited and flawed, and even well-meaning legislators cannot represent their constituents if they do not accurately see who is in their district"--Provided by publisher. Includes bibliographical references (pages 193-210) and index.